Yesterday I met up with Lucy Coats, Susie Day and MG Harris – author friends who all live locally. 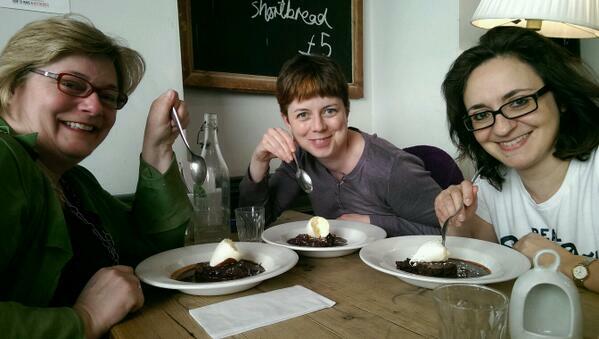 Considering how much we authors like to chat and eat cake, you’d be surprised how rarely we manage to meet up. I think each of us has a certain amount of guilt about taking time away from writing. MG Harris was probably under the most pressure, having committed herself to producing three full-length YA novels between now and next February! Lucy, me and MG, spoons poised! It was a chunk of pure chocolate sugar. VERY bad for us, no doubt, but a very special treat, just like our meeting. Author friends are SO important, since no one else knows quite what the view is like from our side of the fence. Hurrah for puddings! And hurrah for friends!